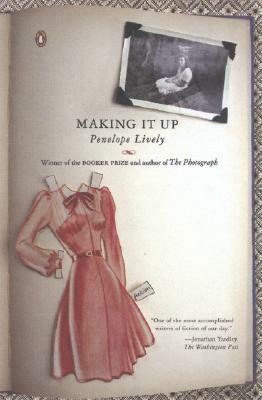 A highly original work, in Making it Up , Penelope Lively examines alternative destinies, choices and the moments in our lives when we could have chosen a different path. In this fascinating piece of fiction, Penelope Lively takes moments from her own life and asks 'what if' she had made other choices: what if she hadn't escaped from Alexandria at the outbreak of WWII? What would her life have been like if she had become pregnant when she was 18? If she had married someone else? If she taken a different job? If she had lived her life abroad? '[A] highly original form of fictional autobiography as well as a fascinating insight into the seemingly random nature of destiny' Daily Mail '[Lively's] writing has always tackled deep questions of identity, memory, love and loss . . . These elegant 'confabulations', as she calls them, allow Lively's talents full range. Intelligent, limpidly well-written and full of human understanding, they evoke the times she has seen and the richness of other lives as well as her own' Sunday Telegraph Penelope Lively is the author of many prize-winning novels and short-story collections for both adults and children. She has twice been shortlisted for the Booker Prize: once in 1977 for her first novel, The Road to Lichfield , and again in 1984 for According to Mark . She later won the 1987 Booker Prize for her highly acclaimed novel Moon Tiger . Her other books include Going Back ; Judgement Day ; Next to Nature, Art ; Perfect Happiness ; Passing On ; City of the Mind ; Cleopatra's Sister ; Heat Wave ; Beyond the Blue Mountains , a collection of short stories; Oleander, Jacaranda , a memoir of her childhood days in Egypt; Spiderweb ; her autobiographical work, A House Unlocked ; The Photograph ; Making It Up ; Consequences ; Family Album , which was shortlisted for the 2009 Costa Novel Award, and How It All Began . She is a popular writer for children and has won both the Carnegie Medal and the Whitbread Award. She was appointed CBE in the 2001 New Year's Honours List, and DBE in 2012. Penelope Lively lives in London.